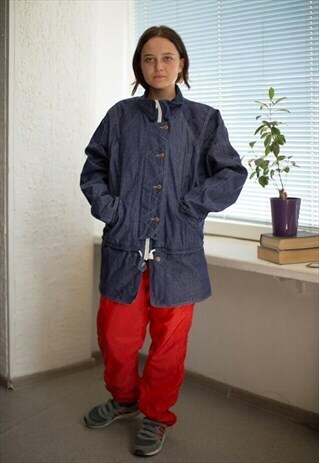 Fantastic vintage 90's navy denim zip and four buttons fastening parka coat with two chest pockets and teo pockets on the front. There is striped lining. UK size not written but looks really flexible like 14-18. Model size on the photo is 8. Measurements: length 33 inches, sleeves 26.5 inches, chest 54 inches, waist 47 inches, hips 44 inches.